Egypt has said that no players in Libya should be excluded in the search for political consensus. 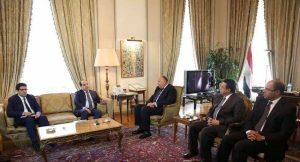 Foreign minister Sameh Shoukry explained this when he saw Presidency Council deputy-president Ahmed Maetig today in Cairo. Shoukry said he supported the Dialogue and the Libyan Political Agreement (LPA) because it remained the only way to bring reconciliation and stability. He also once again pledged Egypt’s desire to help to help Libyan build and efficient and functioning state institutions. Egypt is currently working with Algeria and Tunisia to see if they can fund a way to push along agreement on the LPA. Also in Cairo in the last 48 hours Maetig has talked to Chief of Staff, Lieutenant-General Mahmoud Hegazy who heads Egypt’s National Committee on Libya and Arab League general-secretary Ahmed Aboul-Gheit.